Los Afro-Latinos is pleased to feature Marshalla S. Ramos, author, educator and mother. This interview will also appear in the Los Afro-Latinos Children’s Supplement which will be published later this year. Marshalla’s extensive teaching background, kindergartners to adults, taught her a valuable lesson. Humanity shares similar life experiences; differences occur on an individual basis. That’s why for Marshalla it is essential to focus on the fact that “we are all one.” Elaborating on this theme, Marshalla explained the importance of embracing others for who they are. According to Marshalla, this point of view serves as an essential ingredient for wellbeing. Three years ago, around the time she began writing, Isabella’s Hair and How She Learned To Love It, Marshalla, who grew up in Brooklyn, New York, made her first visit to her family’s homes in Santurce, San Juan and Ponce, Puerto Rico. Her debut book, tells the story of Isabella, an Afro-Boricuan, who lives in Carolina, Puerto Rico. With loving support from her abuela (grandmother), Isabella learns self-love and self-acceptance. Why did you decide to write this book? Skin color and hair texture constantly come up in the classroom. As an educator it was important to create a narrative from a child’s perspective. The voice of the protagonist (Isabella) was more than that of a child speaking. It included the expressions of a female who is of Afro-Latino heritage. During the editing process, a lot of memories resurfaced. Through family stories, I had the impression that my grandmothers, both with dark complexions, were strongly persuaded to marry to “better the race.” This book is my attempt to offer a debt of gratitude to my grandmothers and to honor the lives they lived. Do you consider the book autobiographical or semi autobiographical? I think every book a writer writes is based on something they’ve experienced. Describe the main character Isabella? She’s a beautiful 7-year-old growing up in Carolina. She likes to color each day and draws her family, and wonders why she looks a certain way. She enjoys the view of her yard and playing. People in the community say (negative) things about her color and hair. What role does Isabella’s grandmother play in the story? Abuelita comes to visit one day and overhears how Isabella is upset that her mother made her a brown dress that matches her hair and skin. She’s sitting under the coconut tree and wondering why everyone thinks brown is beautiful. Abuelita asks Isabella questions about the things in Puerto Rico that are brown like cocoa beans, soil etc and what they do. These natural things enrich us and so does Isabella’s presence. An illustration by Michael Murphy from Isabella’s Hair. 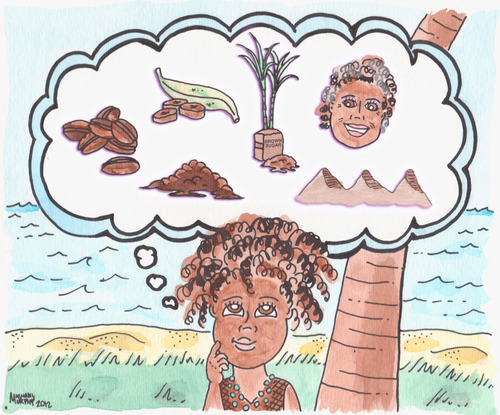 What messages did you learn about your hair growing up? In my immediate family, my mom embraced me and taught me I was beautiful. But, my sister has typical Puerto Rican/ Spanish hair, and comments were made by other relatives that I wasn’t as beautiful, or Nuyorican as my sister. I would get teased. It was painful. As an adult, do you accept your hair? If so, how did you arrive at that point of acceptance? I have locks now. I love them, I love my hair. Around 2007, I stopped relaxing my hair, and felt it was time to embrace my hair texture and who I was, and embracing the term Afro-Latina. I decided it was necessary to understand my African heritage, not to deny this part of me. I wanted people to see the real me. It’s very empowering to feel your own hair texture. It’s much healthier. Is it important for children of color, particularly Afro-Latino children, to have books that feature Afro-Latino children? If so, why? I belong to the Society of Children’s Book Writers and Illustrators (SCBWI). Every month, a magazine is published. One article was about protagonists in children’s books. Less than one percent represent children of color. Even when I was teaching kindergarten and you asked Scholastic (world’s largest publisher and distributor of children’s books), they don’t have these books. If you look at a child of color, they need to see characters that represent a similar experience to them. Children pick up books that interest them or they can relate to. If they don’t find them, they don’t gravitate to literature as much. Why not have books like this available? It’s important – not just for numbers, but for children’s self-esteem. What kind of response/reaction are you receiving from the book? I’ve participated in a couple of book fairs and was at La Casa Azul (New York City Bookstore) for Book Day. My book always sells out and people love it. It was picked up by BarnesandNoble.com. People enjoy the story, and wish they had it when they were young. A young lady bought my book for a friend who adopted a black baby. The book is especially valuable for adopted children and girls. What projects are you working on? A story about an Afro-Latino boy, titled Leon’s Courage. I’m still figuring out the setting, but it will deal with being smart and the implications of being smart in a neighborhood where kids don’t celebrate that. Leon learns to change negatives into positives with the help of his cousin, Isabella. Marshalla dreams of returning to Puerto Rico to read her book at schools and bookstores throughout the island. 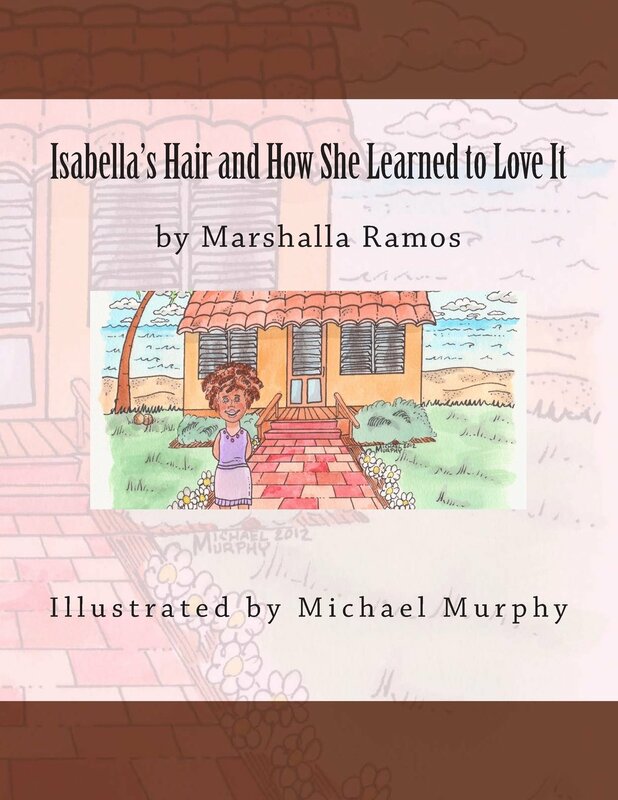 Isabella’s Hair and How She Learned to Love It was published by Create Space and illustrated by Michael Murphy. Connect with Marshalla on Twitter and the Facebook page for Isabella’s Hair.